For as long as time can depict, women have been considered the inferior gender and have been treated as second class citizens for centuries. In the last 100 years women have been started to be given certain rights such as the right to vote and more or less equality in the job sector. Though even in today’s time women still have to face a lot of issues, which their male counterpart’s do not. The situation in Pakistan is no different. Being an Islamic Country does provide some security for the female gender but then again even religion has been used as an excuse to not give women their well-deserved standing. One of the biggest problems women in Pakistan face is domestic violence. In a society where it is common for men to own women, being a father or brother or a husband. Men consider their right to treat the women of their homes, anyway they wish. Domestic violence is not just physical it can be emotional, psychological, sexual, social, and economic. The women do not report these issues to the police as they do not want to further anger their families and the authorities themselves do not provide enough refuge for these women. All and all due to illiteracy and lack of financial aid women stay in those abusive houses and continue being abused. 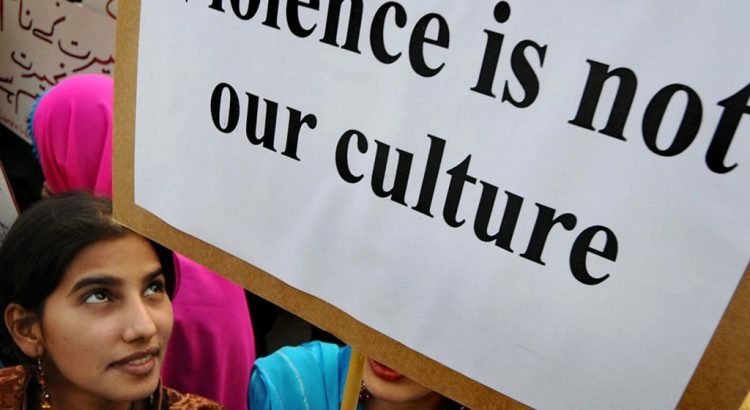 Men in Pakistan consider women their honour and in fear of maintaining their honour certain restrictions are imposed on them ranging from their behaviour, to their work and mobility etc. The Pakistani women are not given space to grow, to be confident and to be independent. Most women spend a majority of their lives inside the four walls of their homes and have no idea how to survive in the outdoor world without a man. Due to this is they depend on men and keep on bearing all the negative attitudes they inflict on them. All in all these women have limited choices. Although a change has been witnessed in the education department of Pakistan but women belonging to rural areas are still in the dark. The justification men give of not giving their daughters an education is that the women do not have to do jobs and feed a family. A women’s place is in the home and her duty is only to tend to needs of her family. Most of the girls study till the 5th grade and then are taken out of school. With such little education, women are unable to get good jobs. If they face financial crisis, women have to take up low grade jobs which pay almost nothing or move towards immoral jobs such as prostitution to feed their families. “No nation can rise to the height of glory unless your women are side by side with you; we are victims of evil customs. It is a crime against humanity that our women are shut up within the four walls of the houses as prisoners. There is no sanction anywhere for the deplorable condition in which our women have to live.” No truer words could have been spoken then these. Mohammad Ali Jinnah beautifully explained a women’s role in this society. In the last years there has been a significant amount of chance and women have been provided relief from these issues till some extent. Government bills such as Protection of Women Act 2006 have given hope to the women of Pakistan. However, there is much work to be done, to raise the status of women in Pakistan.